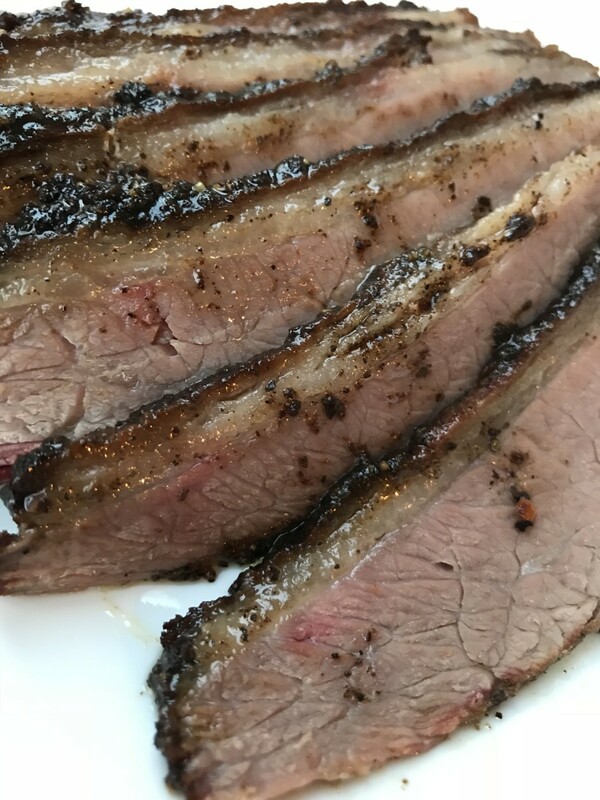 Corned beef is like most foodstuffs in that it is of course best prepared fresh from scratch using basic ingredients - in this instance, that would be a piece of beef like brisket, salt and a variety of pickling spices. 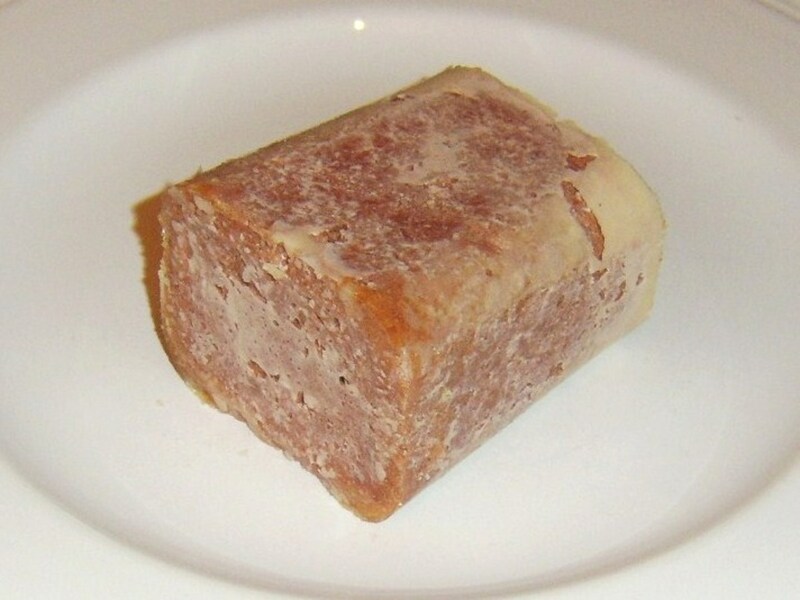 The biggest problem with preparing corned beef in this way (any cost issues aside) is that the whole procedure usually takes a minimum of four or five days from start to finish due to the brining process. This means that many people will either not be able to spare the time, or find it too much trouble to prepare for the sake of what may just be one family meal. It is for this reason of convenience - and to hopefully suit a majority - that canned corned beef has been used in the recipes on this page. 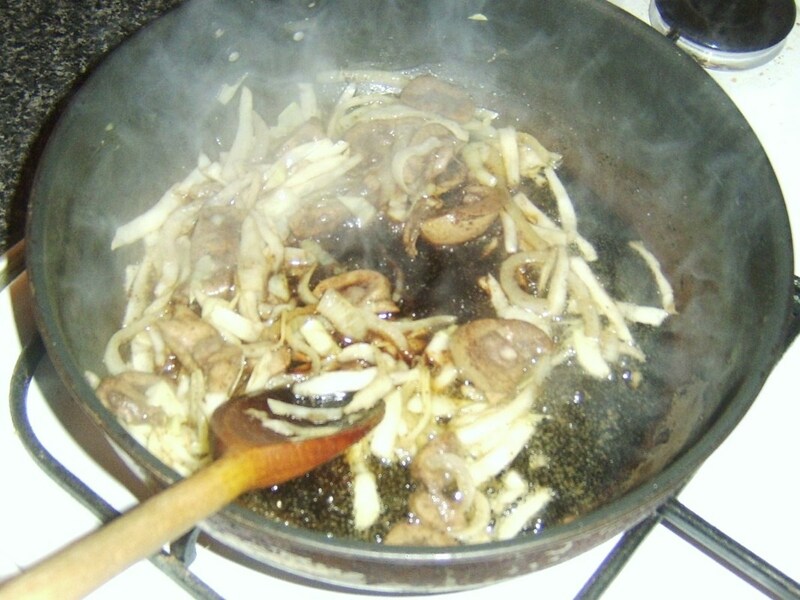 Heat a little vegetable oil in a frying pan and gently fry the cabbage for two or three minutes until just softened. 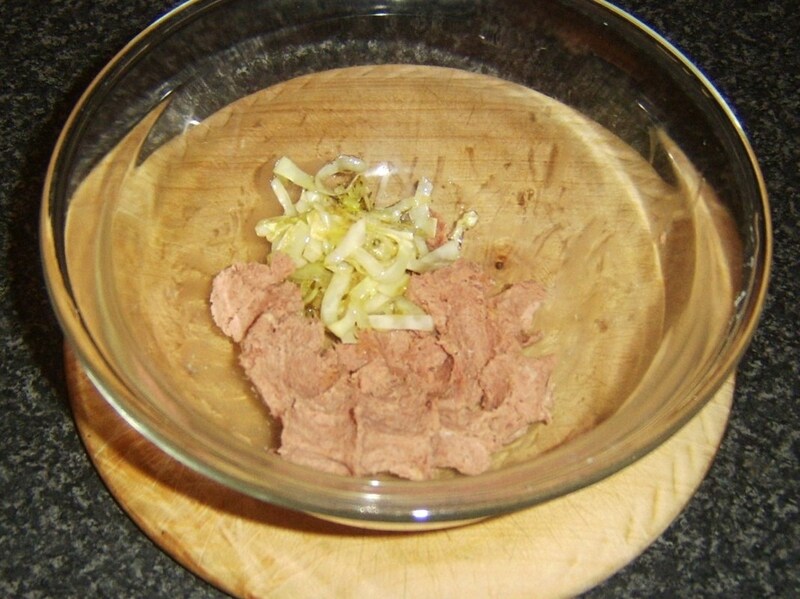 Put the corned beef in a large bowl and squeeze/mix by hand to a paste. Allow the cabbage to cool for a couple of minutes before adding to the beef. Season with salt, pepper and thyme and mix again by hand until everything is evenly combined. 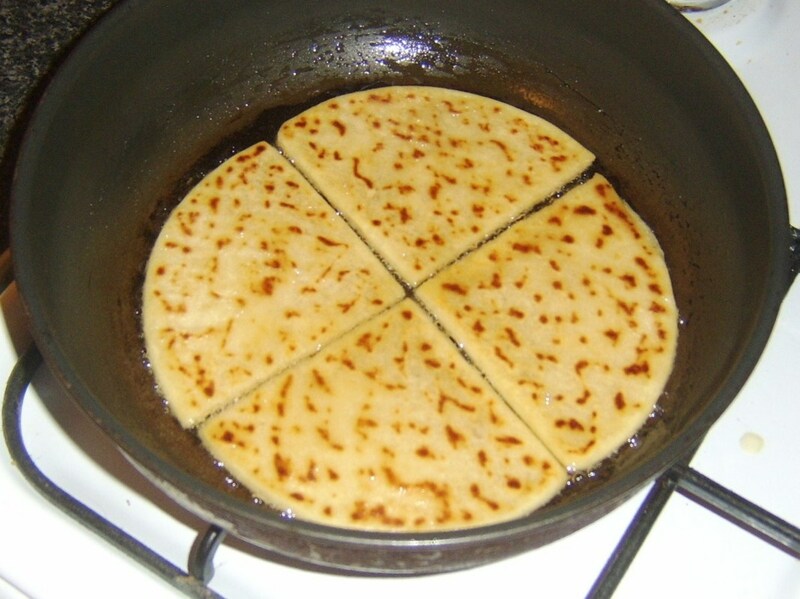 Split the mixture in two and shape in to approximate triangles (see photo above). You may find doing this on a plate and using a large knife blade to assist a benefit. 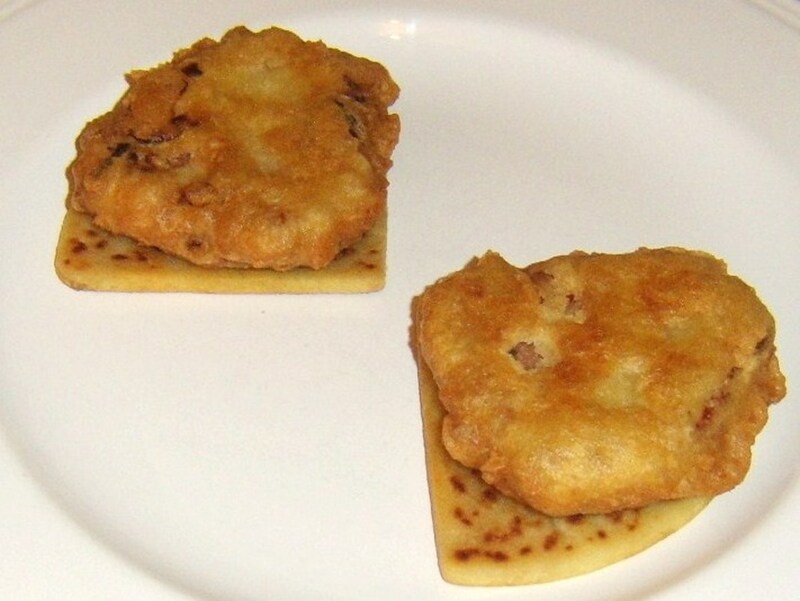 Lightly flour a plate or appropriate dish. 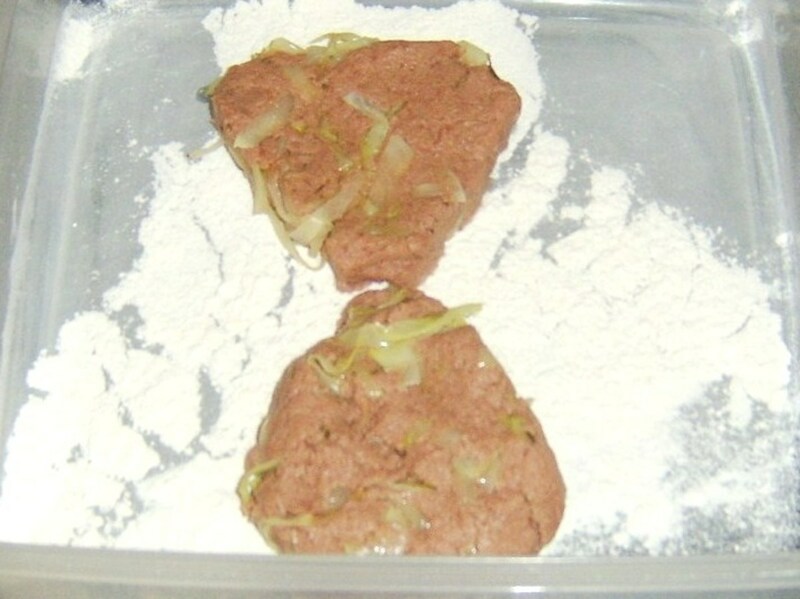 Lay the patties on it and refrigerate for at least half an hour to firm up (longer is better). Spoon two tablespoons of the flour in to a flat bottomed bowl. 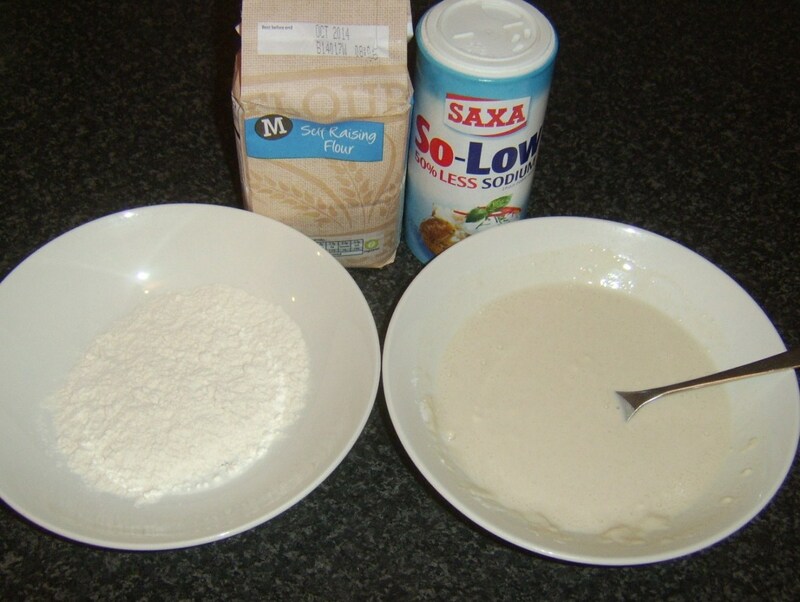 Season with salt and slowly add some cold water, whisking with a fork, to form a thick batter. 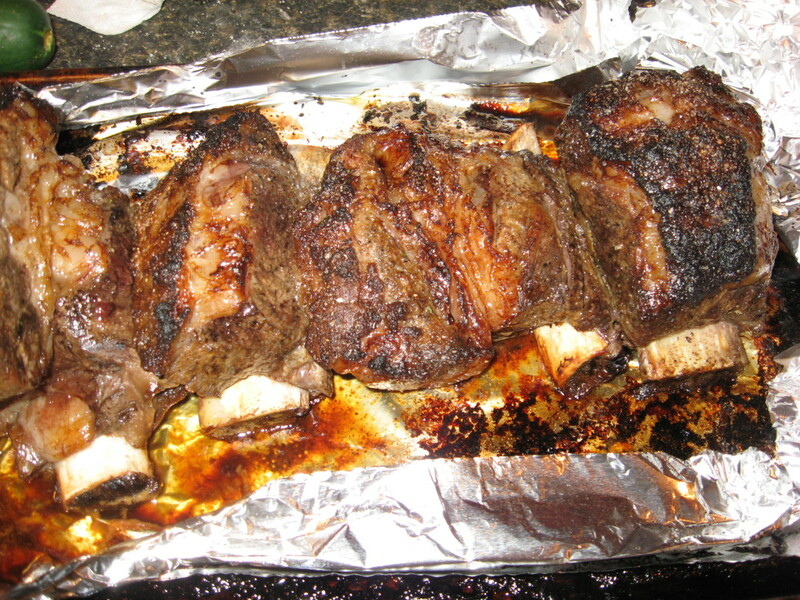 Refrigerate to rest for fifteen minutes. 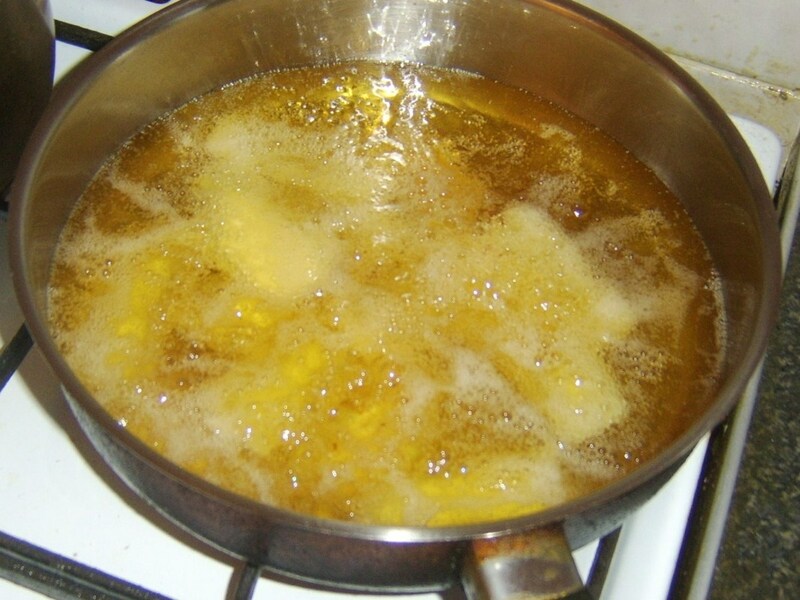 Put another couple of spoons of flour in to a second bowl and bring a deep frying pan of oil to a fairly high heat. 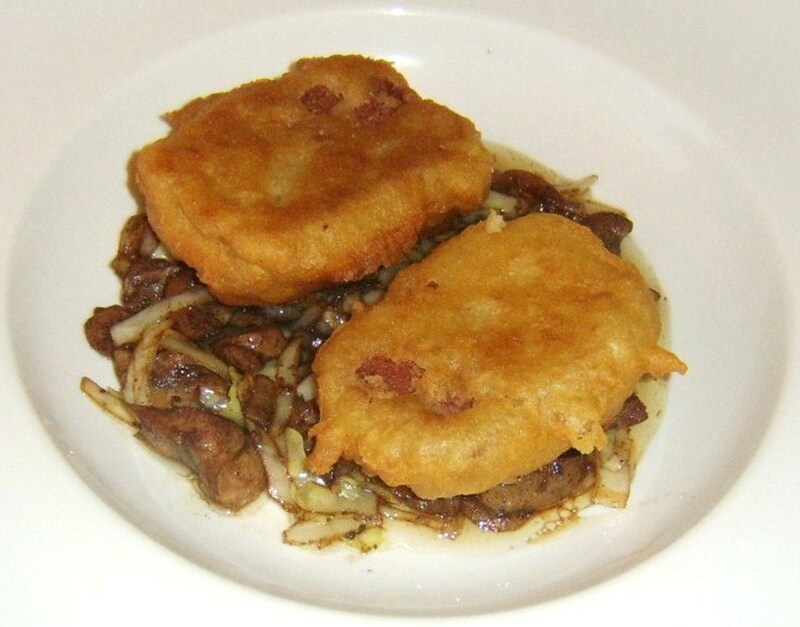 Carefully pat each patty in the flour, dip in the batter and lay in the oil. 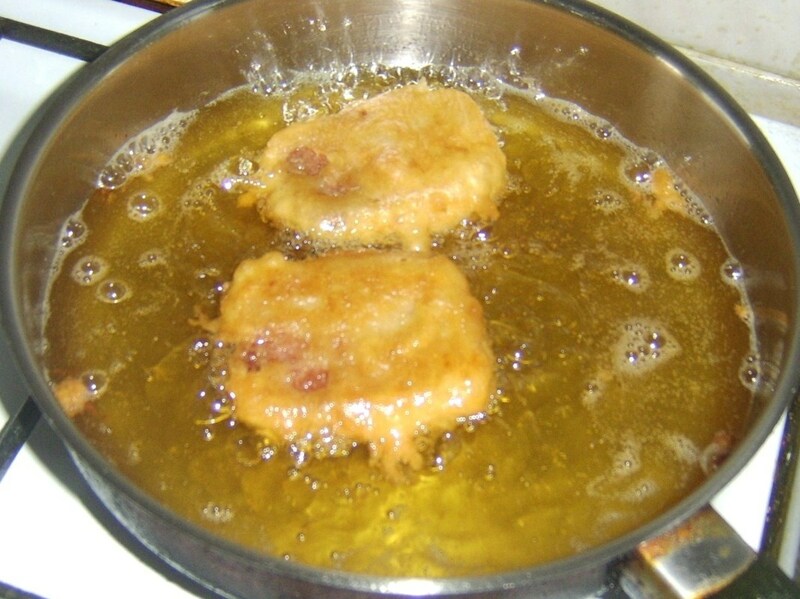 Fry for around two minutes each side until the batter is golden. Drain on a plate covered with kitchen paper. 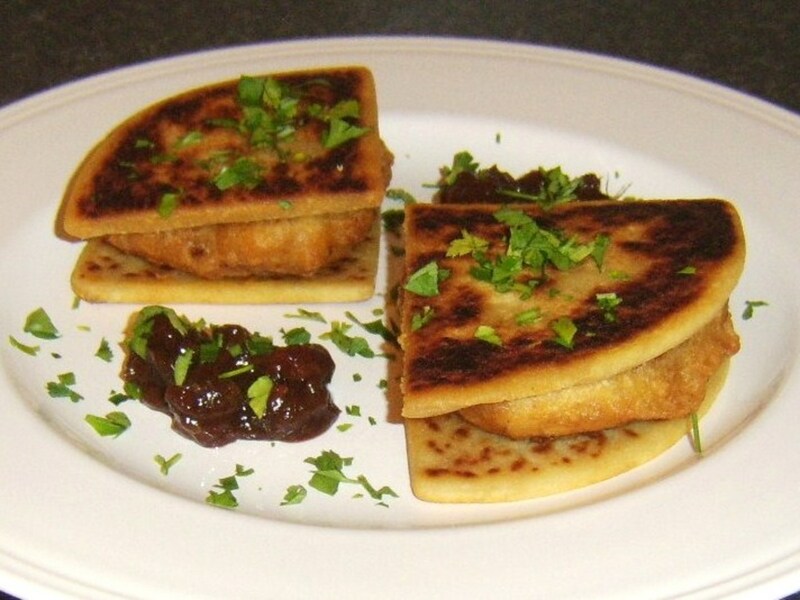 Fry the tattie scones for around thirty seconds each side in a little oil in a frying pan just to heat through (unless preparing them fresh). 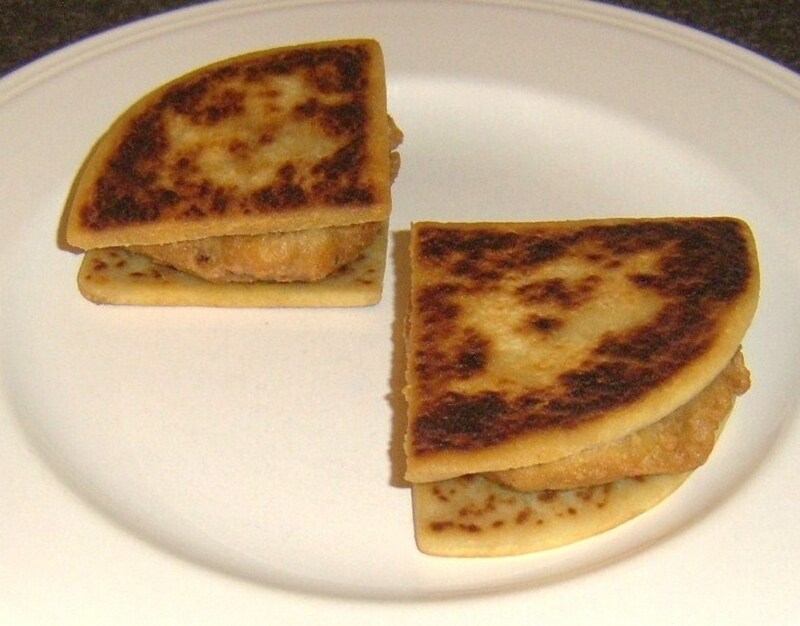 Lay two tattie scones on a plate, a fritter on top of each followed by the remaining two scones. Spoon the optional pickle on to the plate and garnish with the chopped parsley. 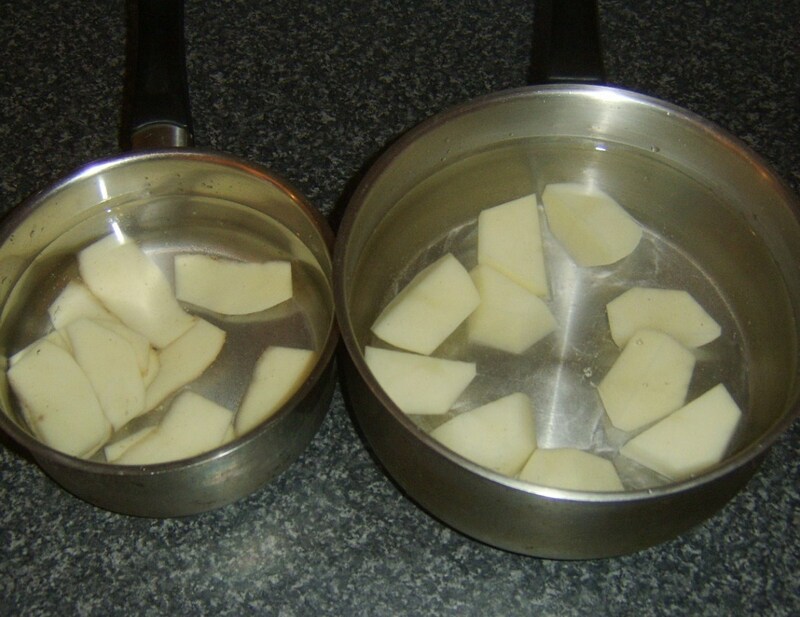 Peel the potatoes carefully, trying to get the skins off in even strips around two inches by three-quarters of an inch. 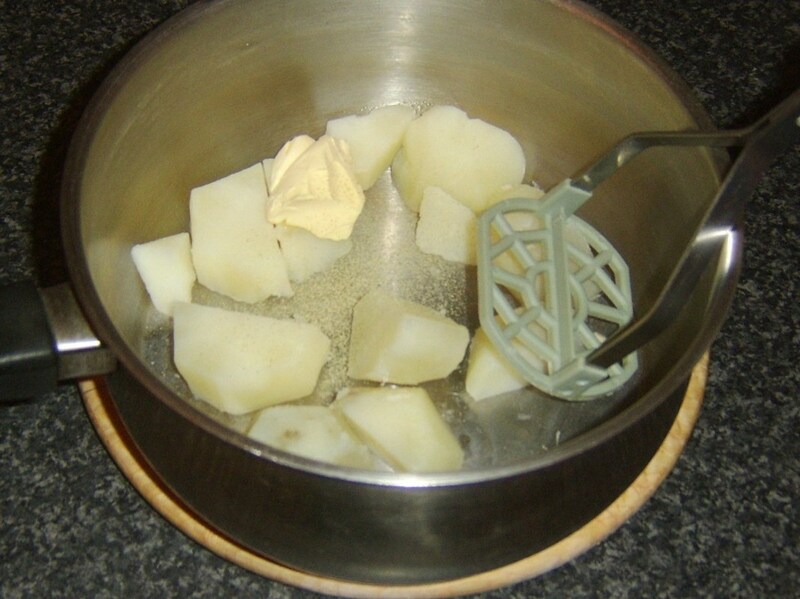 Chop the potatoes in to large chunks. Steep the skins and the potato pieces separately in cold water for about ten minutes. Drain the skins and add them to a plastic dish and the refrigerator for half an hour. Drain the potatoes and add them to fresh, slightly salted water. Bring the water to a simmer for fifteen to twenty minutes until they are just softened. 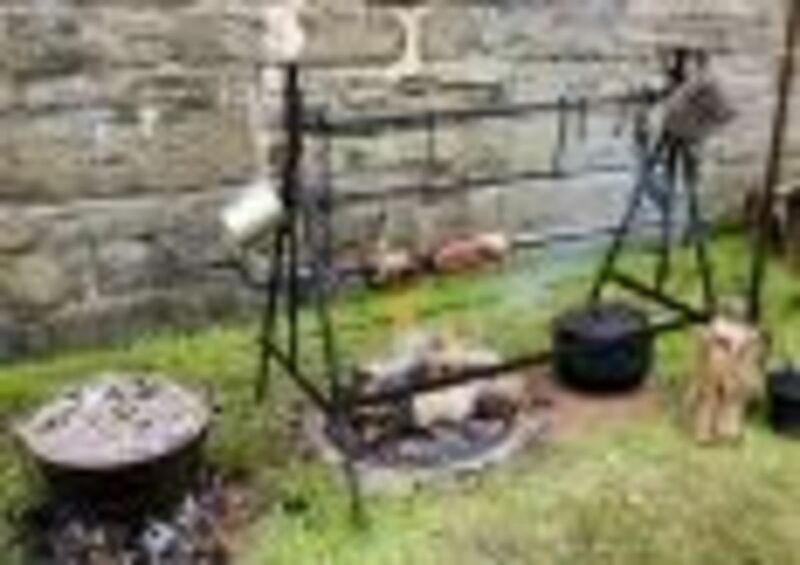 The potatoes should be thoroughly drained and returned to the empty pot. In order to get rid of as much of the moisture as possible, it is important to leave them to steam off for around five minutes before they are mashed. 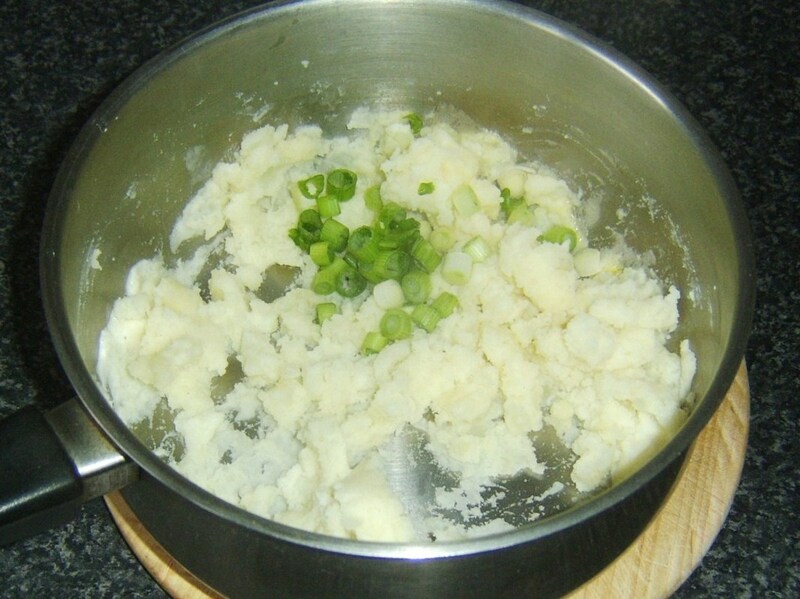 Add a bit of butter, season with white pepper and mash with a hand masher for the best consistency. Using a food processor is not a good idea as a puree is instead formed and the final effect is somehow not quite right. Cover the pot and set aside to cool. 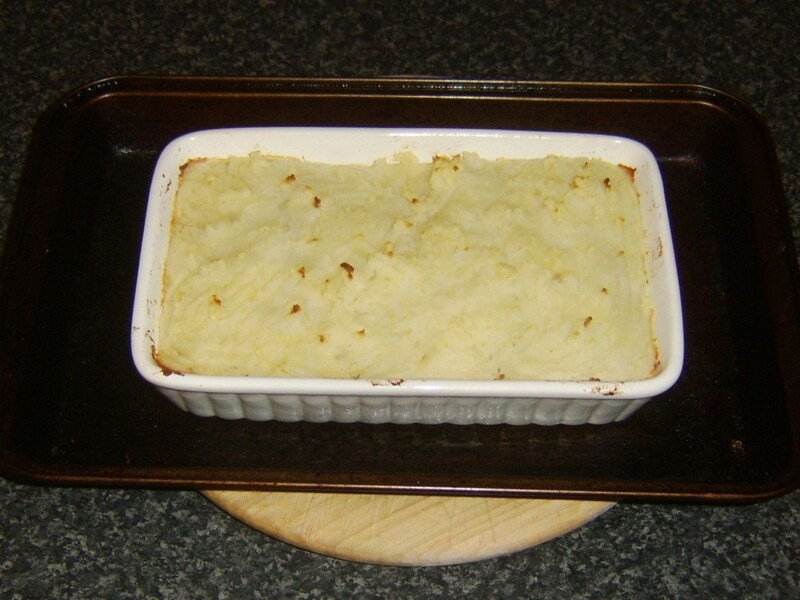 When the mashed potato is just about cool (roughly half an hour), put your oven on to preheat to 400F/200C. 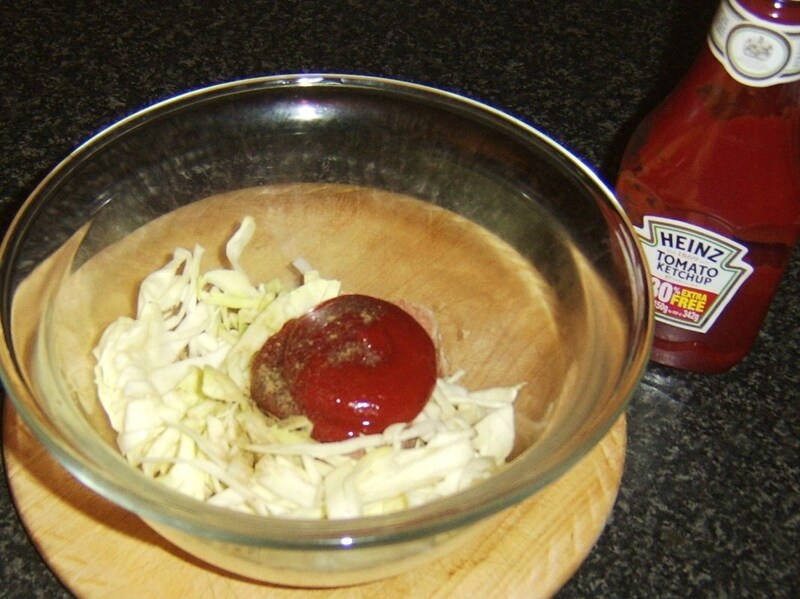 Put the corned beef in a large bowl with the cabbage and tomato ketchup. Season with salt and black pepper. Mash everything together by hand to evenly combine before arranging in the base of an ovenproof, appropriately sized pie dish. 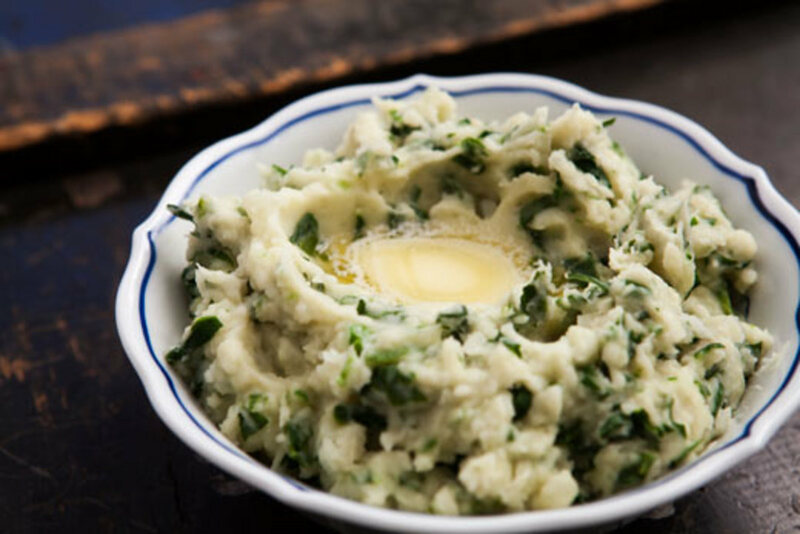 Spoon the mash on top of the corned beef and cabbage in the first instance in small clumps. 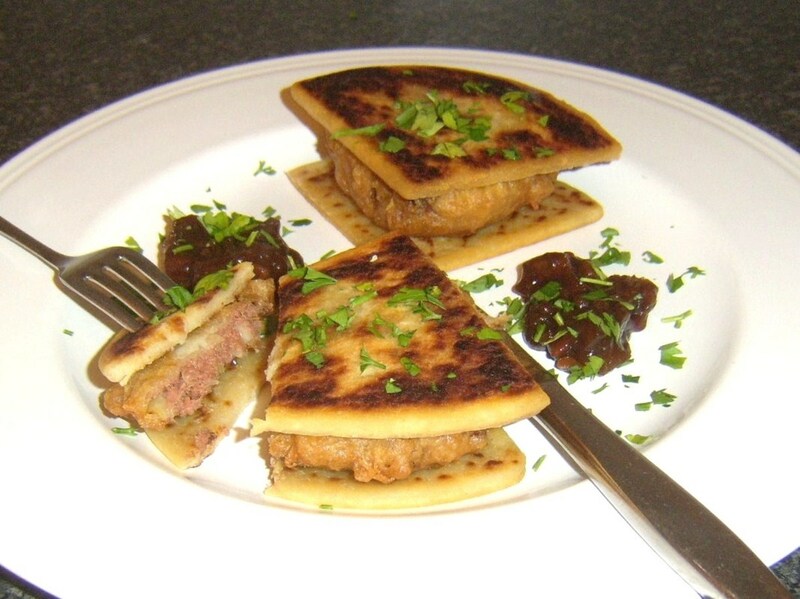 This makes for most even distribution and tends not to mix it in to the filling. Use a knife dipped in boiling water to smooth it out a little bit but leave it slightly uneven and put the dish in to the oven for half an hour. 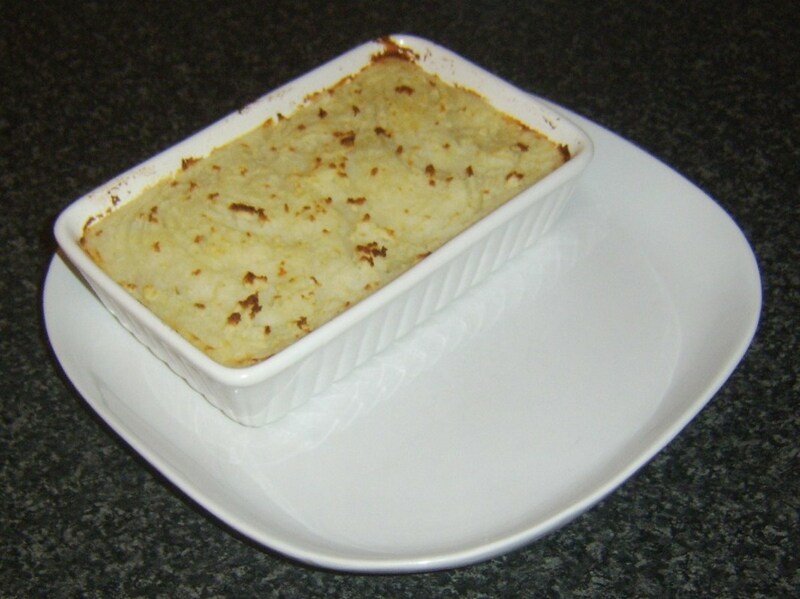 Take the cottage pie from the oven. Browning the potato slightly under a hot gril/broiler is optional but does add a little splash of extra colour as well as a crispness to the topping. Leave the cottage pie to rest for five minutes while you deep fry the potato skins in hot oil and poach the broccoli florets in boiling, salted water. 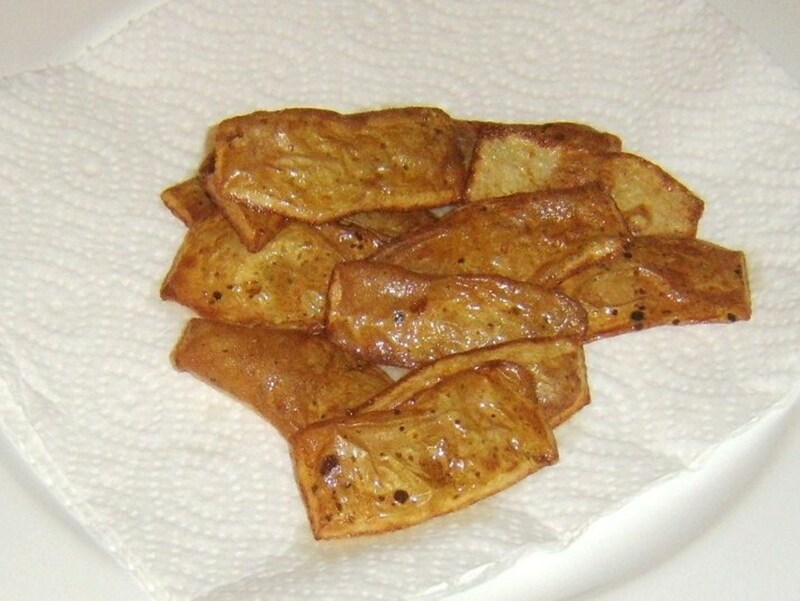 Drain the broccoli through a colander and the potato skins on kitchen paper on a plate. 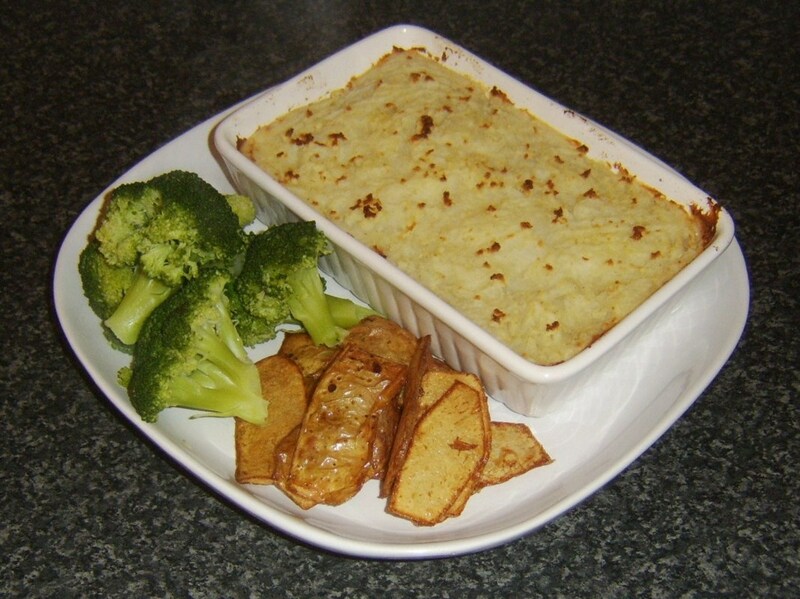 Sit the cottage pie in its dish on your serving plate and arrange the potato skins and broccoli alongside. 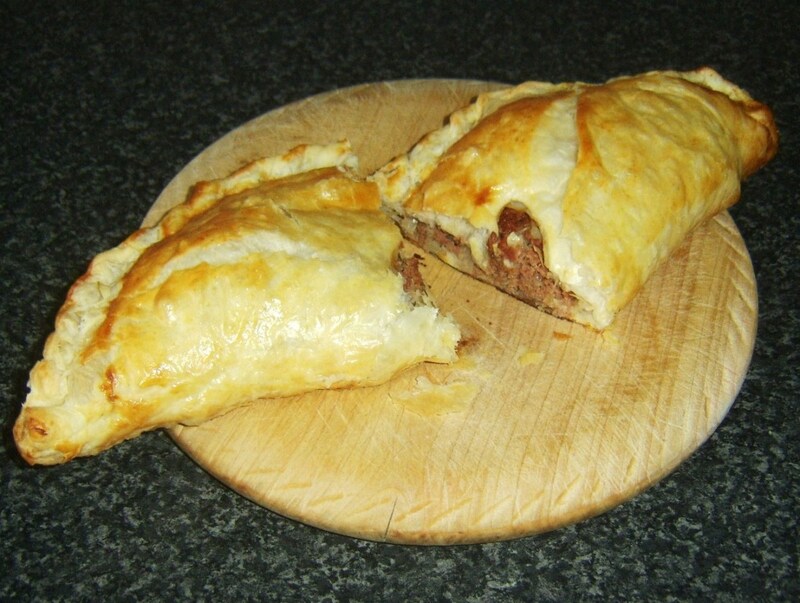 Beef (steak) and kidney is a classic pie and pudding combination. 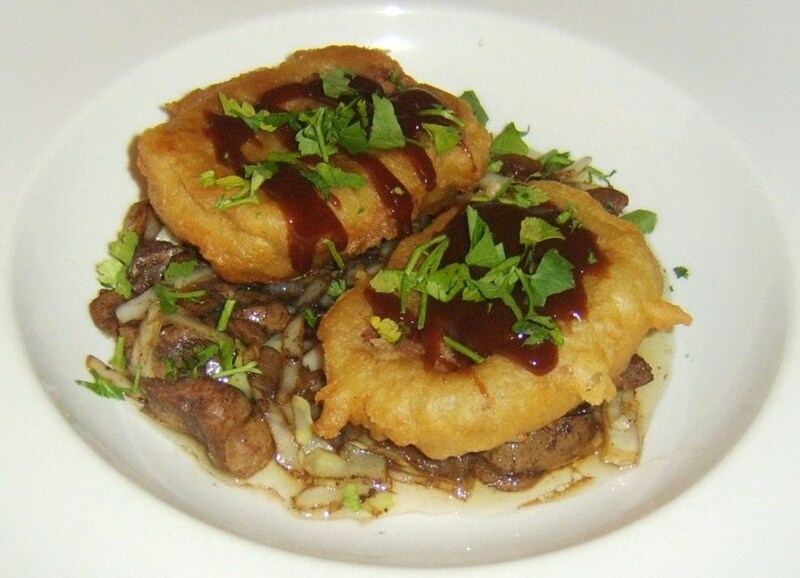 It is these personally much loved dishes which provided the inspiration for this creation. The simple batter should be prepared first as it ideally wants 10 to 15 minutes' resting time in the fridge. Add two of the tablespoons of flour to a deep plate, season with a little salt and whisk in just enough cold water to form a smooth batter. 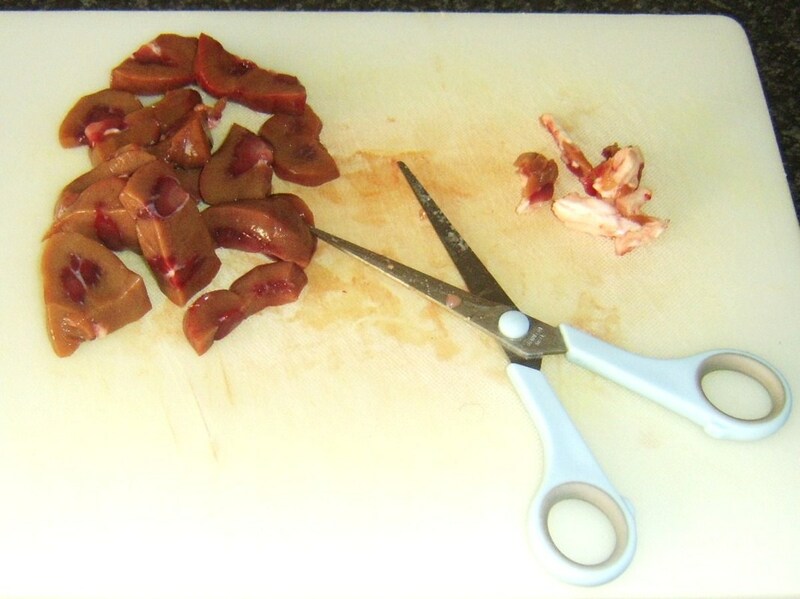 These ox kidneys were bought ready cleaned and chopped but as can so often be the case, there remained some white, fatty tissue on the inside. 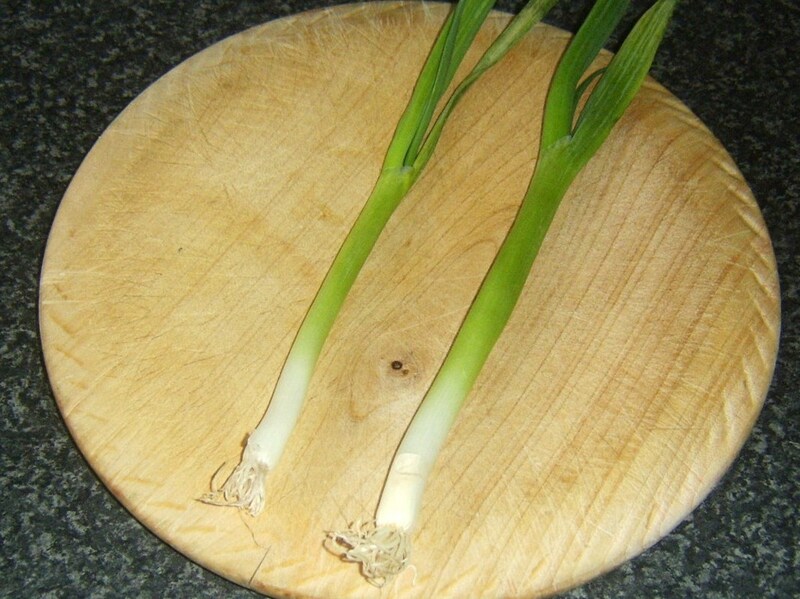 This was cut away using kitchen scissors, which make the job far easier than using a knife. 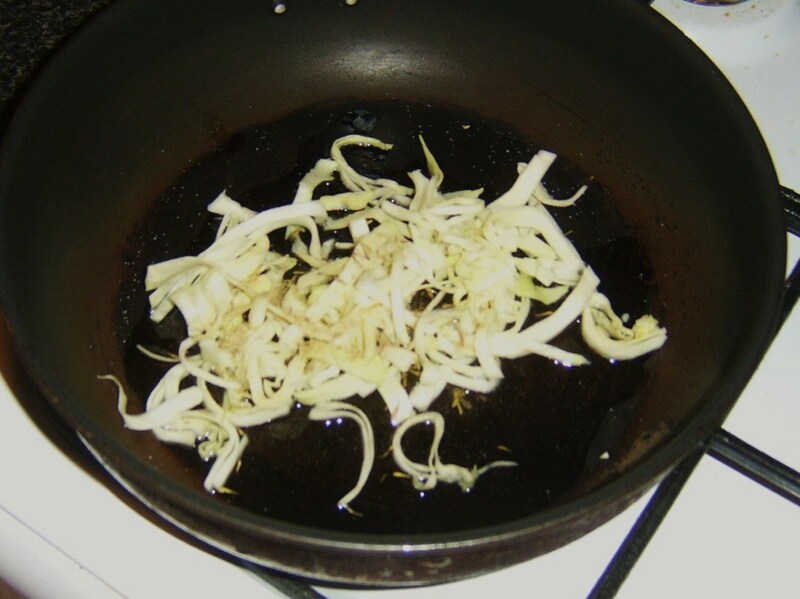 Pour a little vegetable oil in to a frying pan and gently heat. 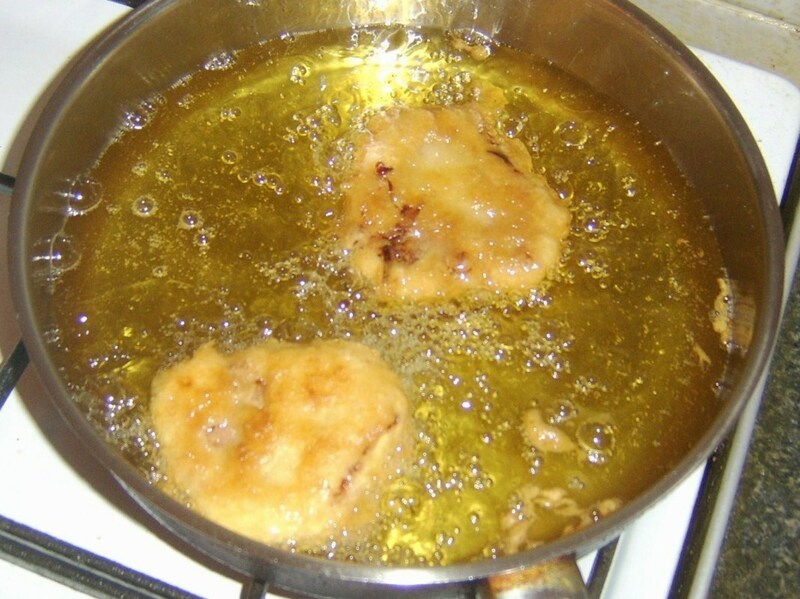 At the same time, start a deep pan of oil heating to a high heat for the fritters. 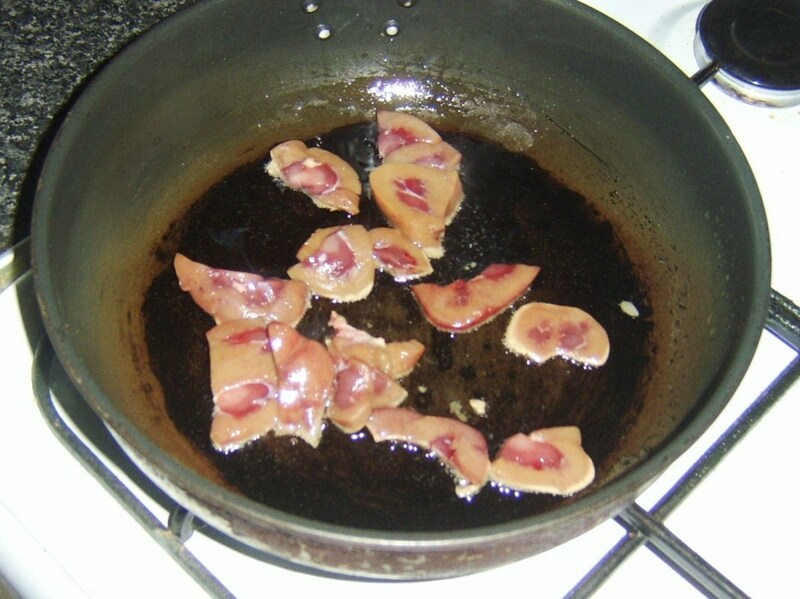 Add the kidney pieces to the frying pan and season with salt and pepper. 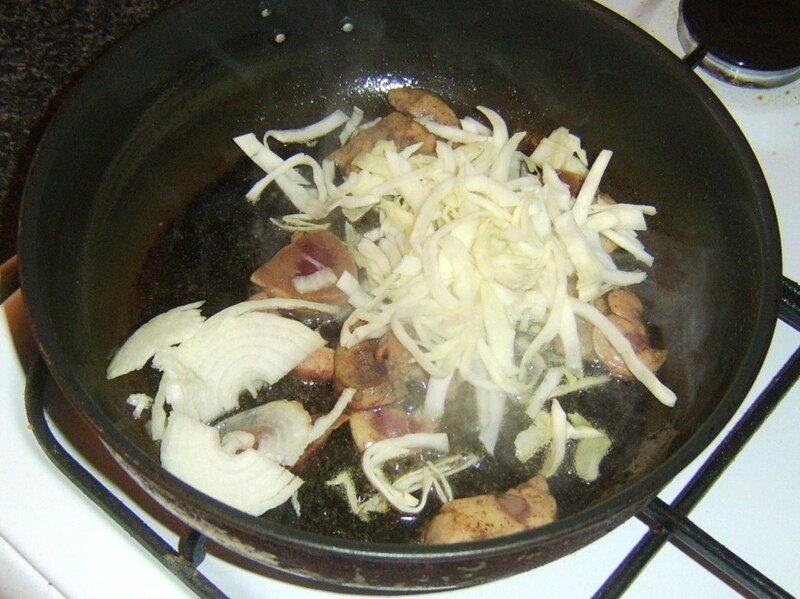 Stir fry for a couple of minutes before adding the cabbage and onion to fry for a further couple of minutes. 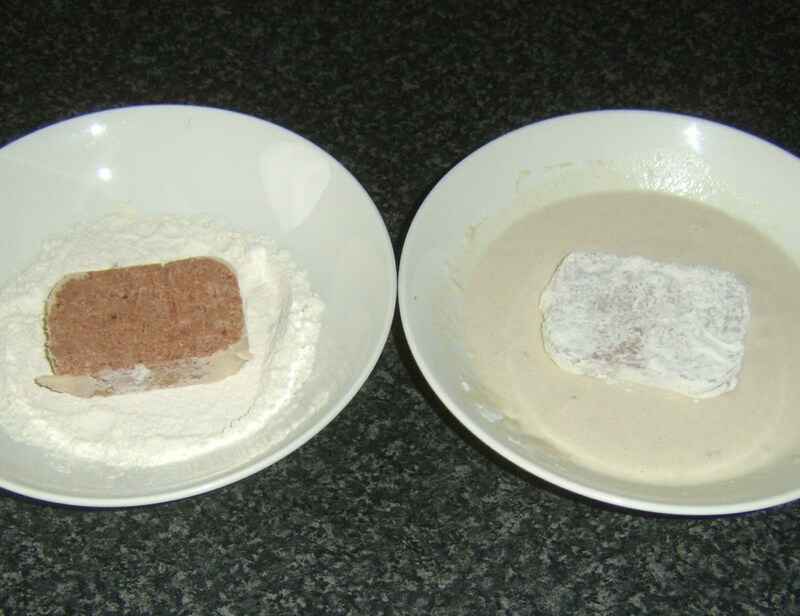 Put the remaining flour in to a second deep plate and pat both slices of the corned beef in it (don't forget the edges) before dredging in the batter. Carefully lay them away from your body and in to the hot oil to fry for a couple of minutes each side. 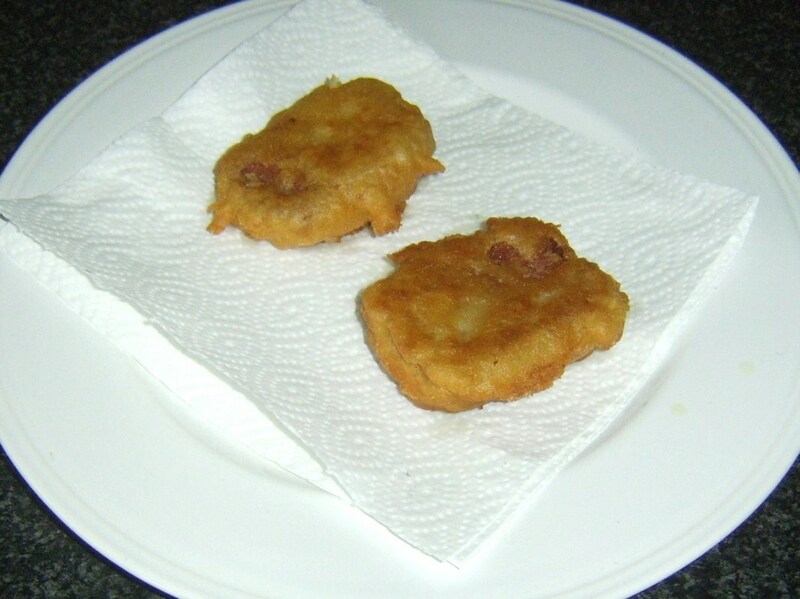 Drain the corned beef fritters on kitchen paper. 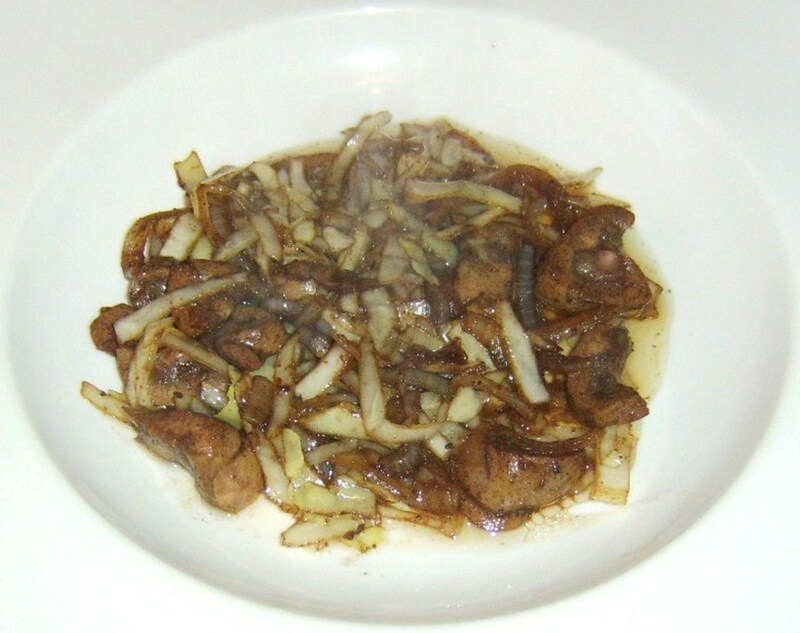 The optional soy sauce should be added to the stir fry for the final half minute or so's cooking. 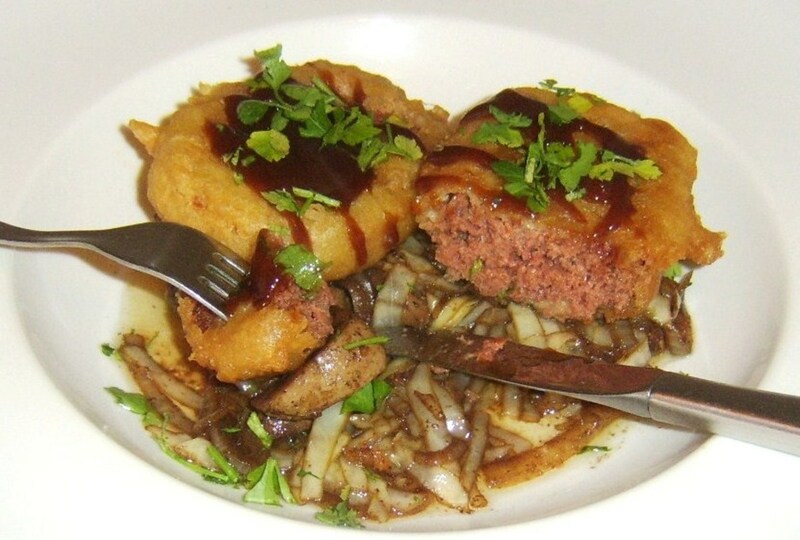 A slotted spoon is best for plating the kidney and cabbage in the form of a bed for the fritters before the parsley is scattered on the whole as a final garnish. Start your oven preheating to 210C/425F. 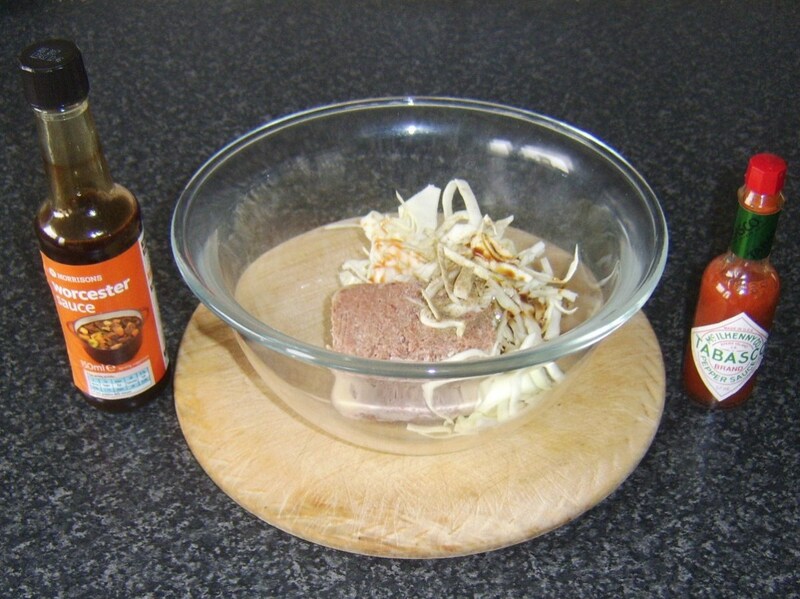 Put the corned beef, cabbage, Worcestershire sauce and Tabasco sauce in to a bowl. Season with salt and pepper. 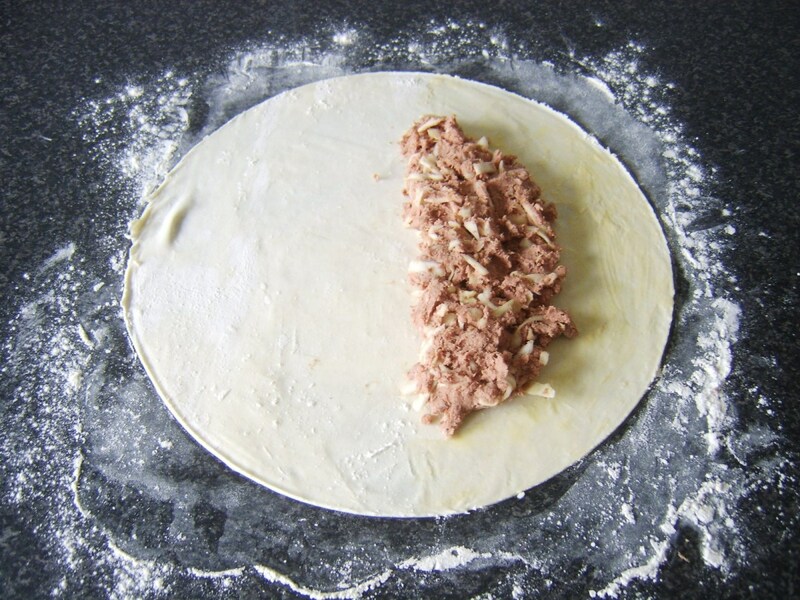 Mix thoroughly with your hand to combine in to what will become the pasty filling. 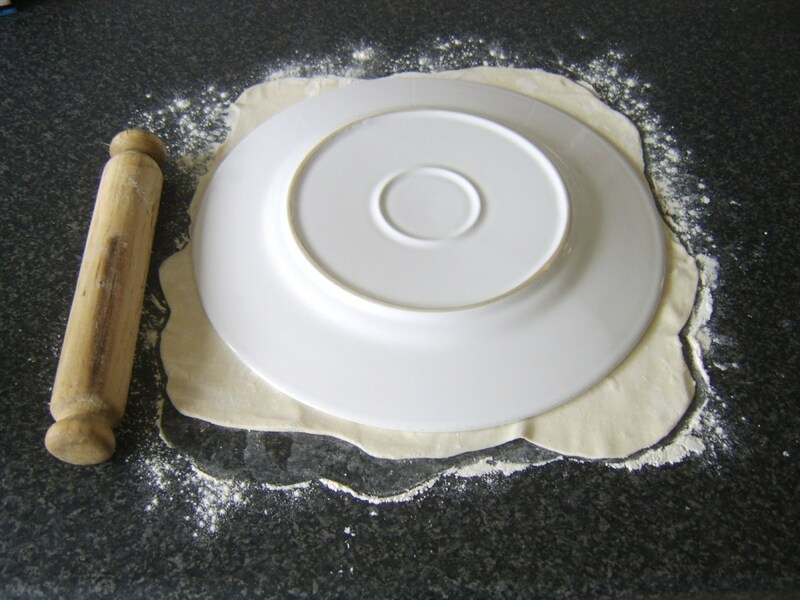 Flour a clean, dry surface and roll out the pastry evenly to a square just large enough that you can use a 13-inch dinner plate as a template to cut a circle. 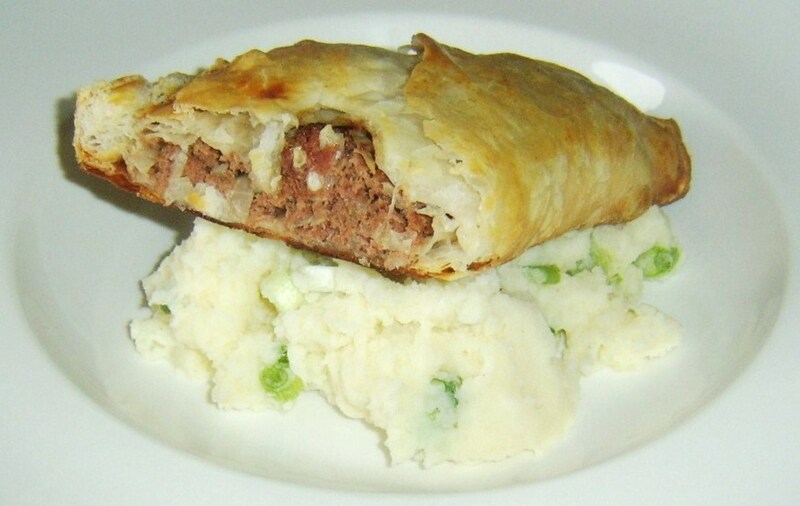 Arrange the filling on half the pastry (refer to photos above) being sure to leave a border of an inch to an inch and a half. Lightly dampen border with a little of the beaten egg. 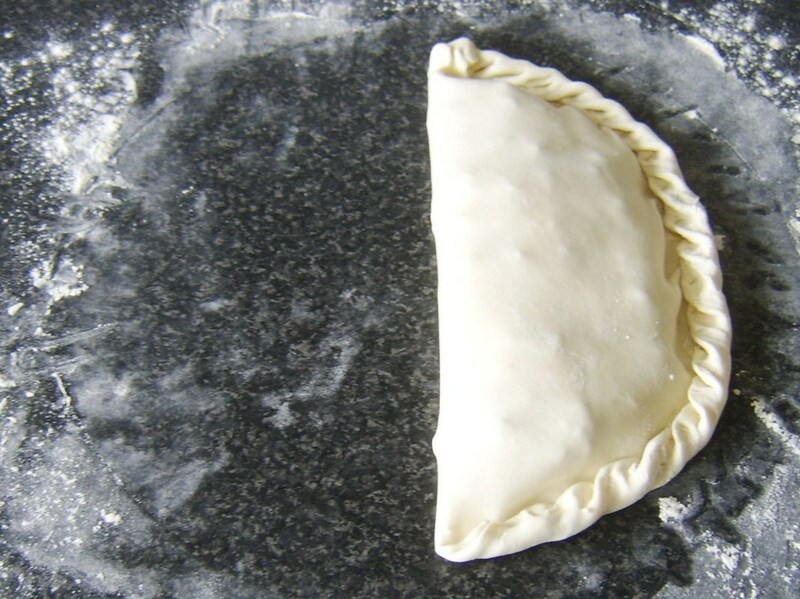 Fold the pastry over and crimp around the edges. Lift on to a lightly oiled baking sheet with a fish slice or large spatula. Glaze all over with beaten egg and cut a steam vent in the centre. Bake for half an hour or until beautifully golden. When the pasty is on the oven, peel the potatoes and roughly chop. Steep in cold water for ten minutes. 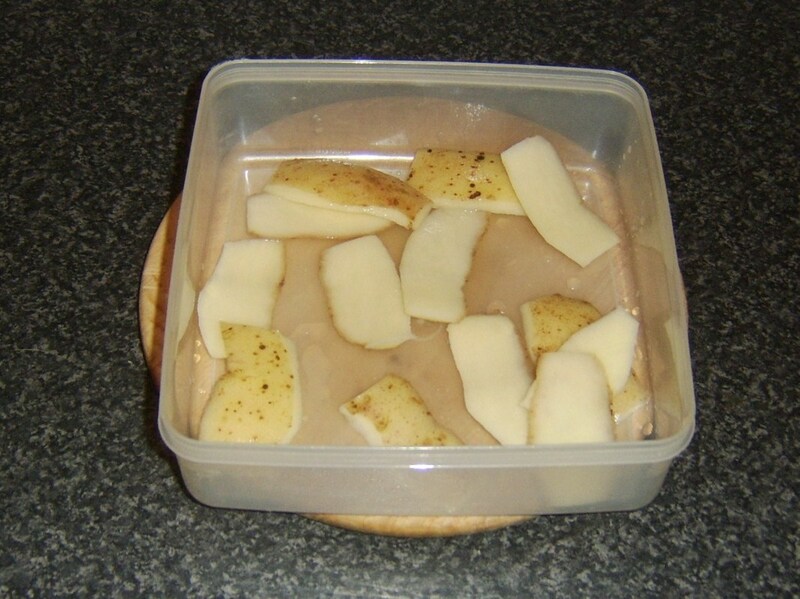 Drain the potatoes and add to fresh, slightly salted cold water. Bring to a simmer for around twenty minutes or until just softened. 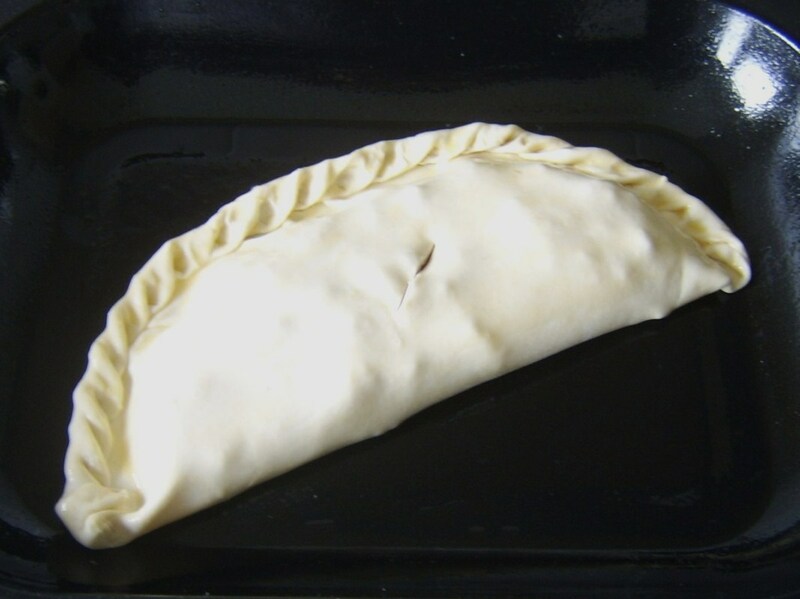 When the pasty is ready, remove from the oven and transfer to a wire rack to briefly rest. 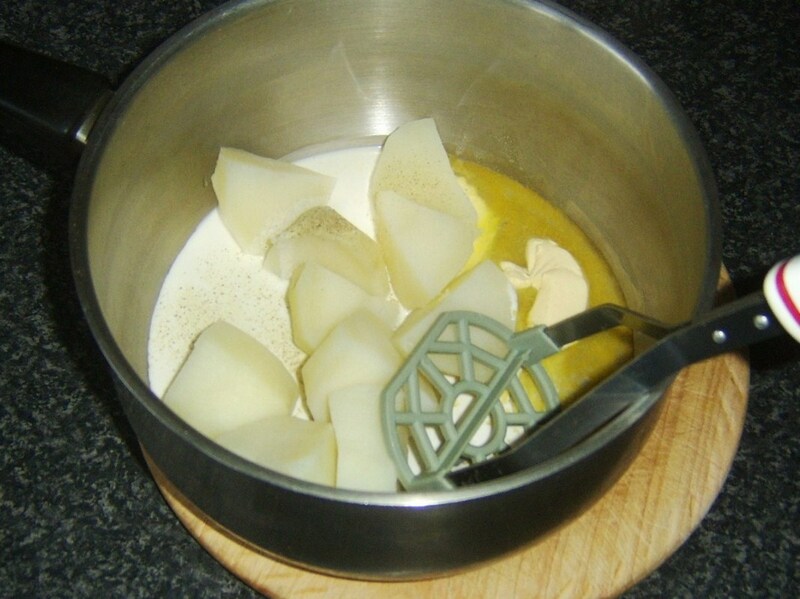 Drain the potatoes and allow to steam for a few minutes before adding the butter and cream to mash. After mashing, stir in the chopped onions/scallions and stir with a spoon. This combination is what is known as champ. Arrange as beds on two serving plates. 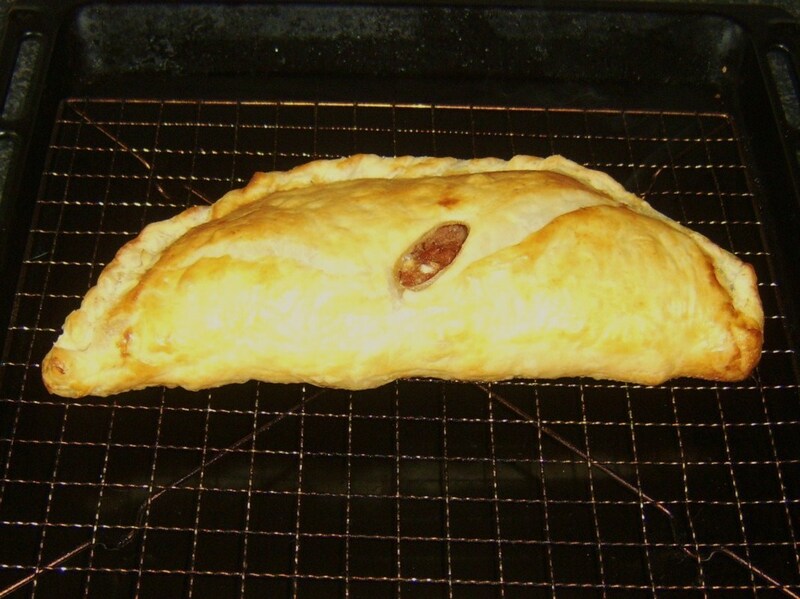 Lift the pasty to a chopping board and cut in half. Lay one half on each of the champ beds to serve. Thank you for reading and hopefully you will give some of these ideas a try. 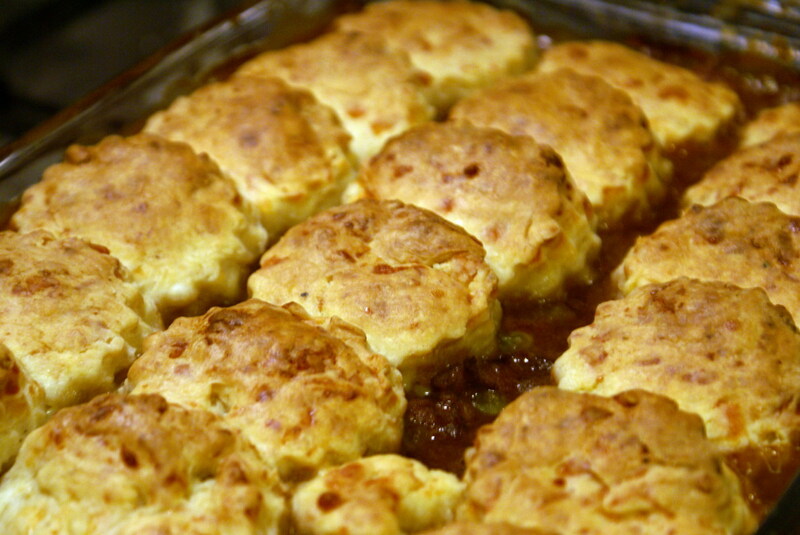 Great looking and sounding recipe. I pinned it to Pinterest, voted up and awesome. This looks like a great recipe to try. Thank you for sharing this recipe. Thanks, Thelma and I hope you enjoy any of the ideas which you try. Thanks DickCobra - they were a pleasure to eat as well as write about! Yeeeh haaaa! These look delicious. WoW! I´m getting hungry looking at the photos. 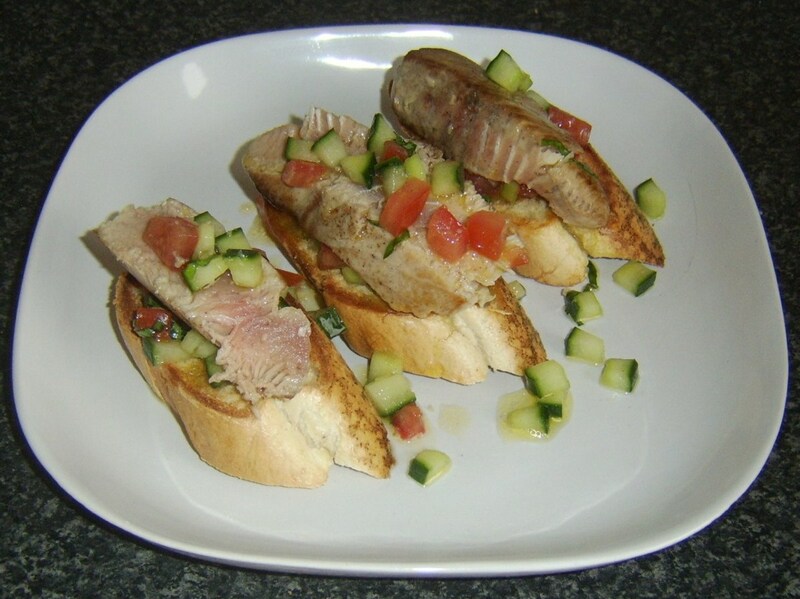 Thanks for sharing the mouthwatering recipes. I would definitely try some of those. 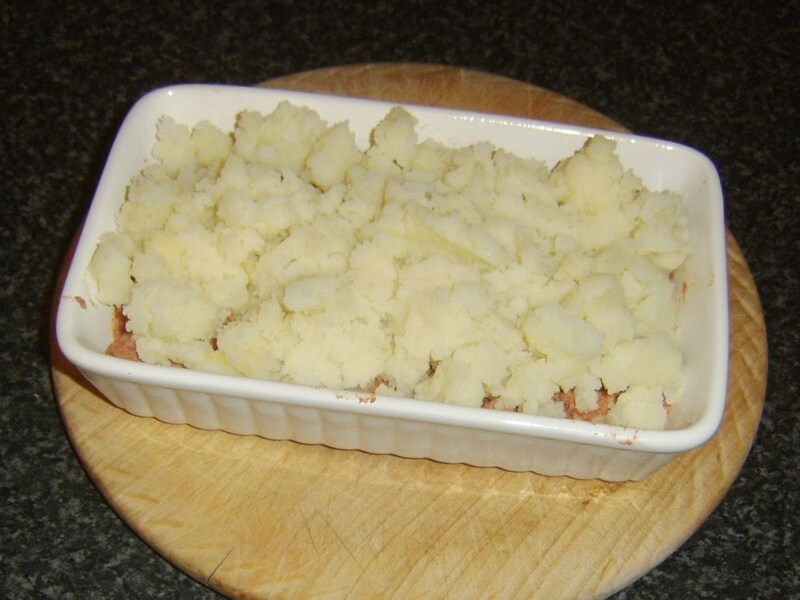 Oh my, Gordon Hamilton, these canned corned beef and cabbage recipes are so yummy and EASY! My favorite is the Cottage Pie. I will have to try it. I missed my corned beef and cabbage this Saint Patty's Day. I haven't made it in so long. 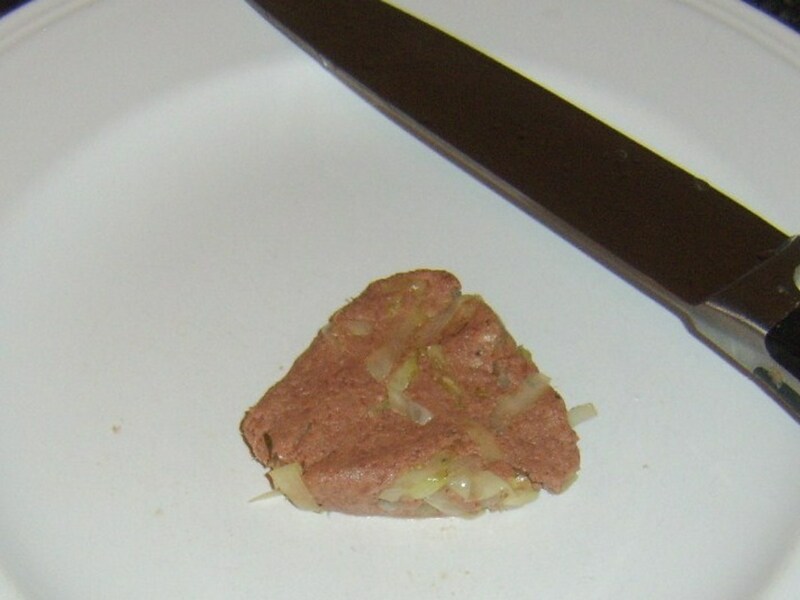 I used to live off canned corned beef in college because it was so affordable and tasty. You've renewed my taste buds for some. Thanks for the great hub, as usual. Up and useful. Great Hub Thanks for the recipe!!! 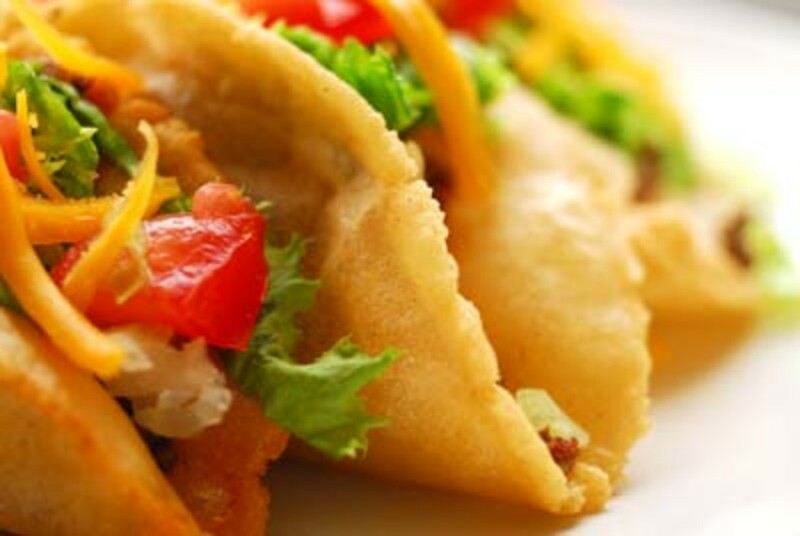 It can be surprising just what we can do with this simple foodstuff, cecileportilla. Glad you like the ideas. Thanks for visiting. Wow. Really great hub! 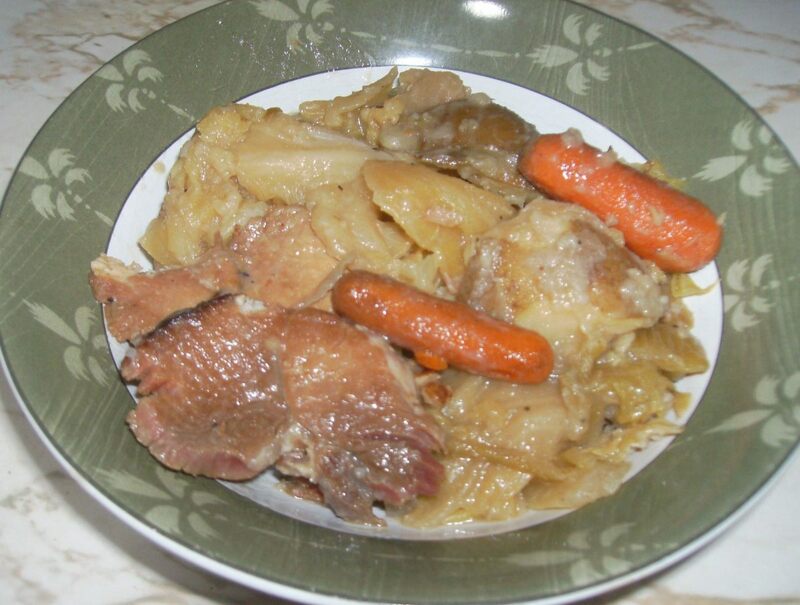 I usually have corned beef the only boring ways with cabbage or with rice or potatoes. 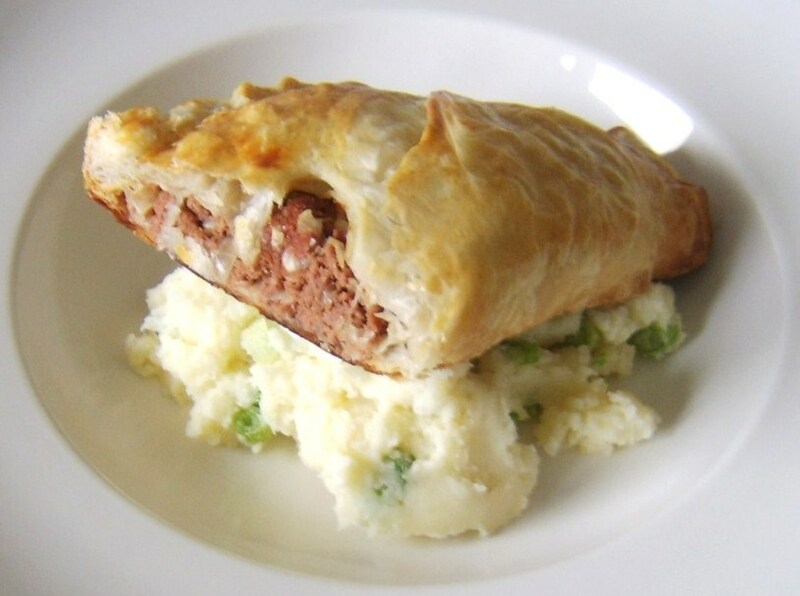 Never heard of pastry, fritter, or a pie that included corned beef. Thanks for these great recipes! Hi, joanveronica and thank you. I love watercress but only eat it fresh, I'm afraid, either as part of a salad or even on its own in a bunch as a snack. I've never tried nasturtium leaves to the best of my knowledge or even seen them anywhere available to buy. I would love to give them a go, however, and will ask around. Good luck with your research and I hope to hear how it goes. The spaghetti sauce idea sounds interesting Chin chin - that certainly didn't occur to me. I'll bear it in mind! Thanks for visiting and commenting. 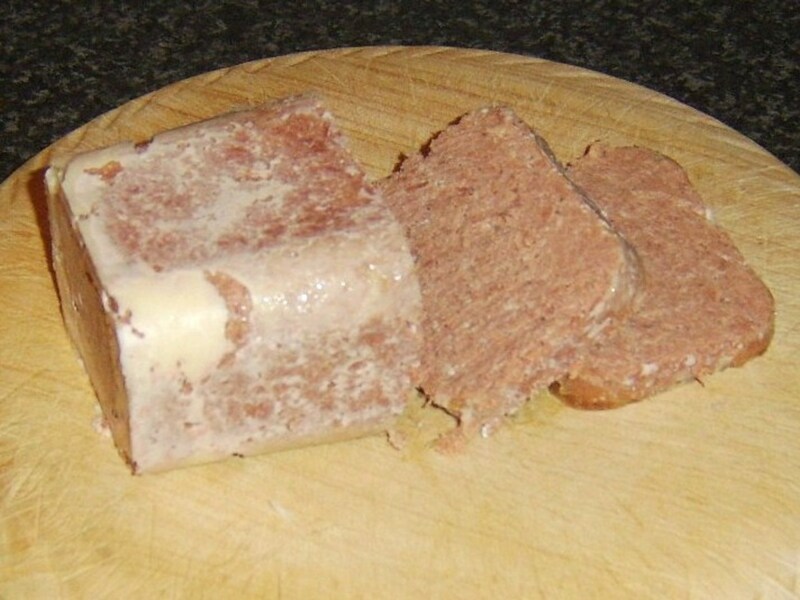 I will have leftover corned beef this year, I always do. A good time for experimentation; I just hope it looks as good as yours. First time to read other recipes using corned beef. So far, I only cook corned beef by sauteing it and adding potatoes and carrots. There's also one time when I substituted it for the ground meat in spaghetti sauce. Hi Gordon, I left you a message on the bubble, but nothing happened. I want to know if you've cooked with watercress, and if you have tried changing these leaves for nasturtium leaves. I'm researching about cooking or roasting or whatever, with nasturtium leaves, not just salads, that's been done. Maybe you could have some info? Or try something? Lovely as usual. Voted up and shared! Nicely done as usual! 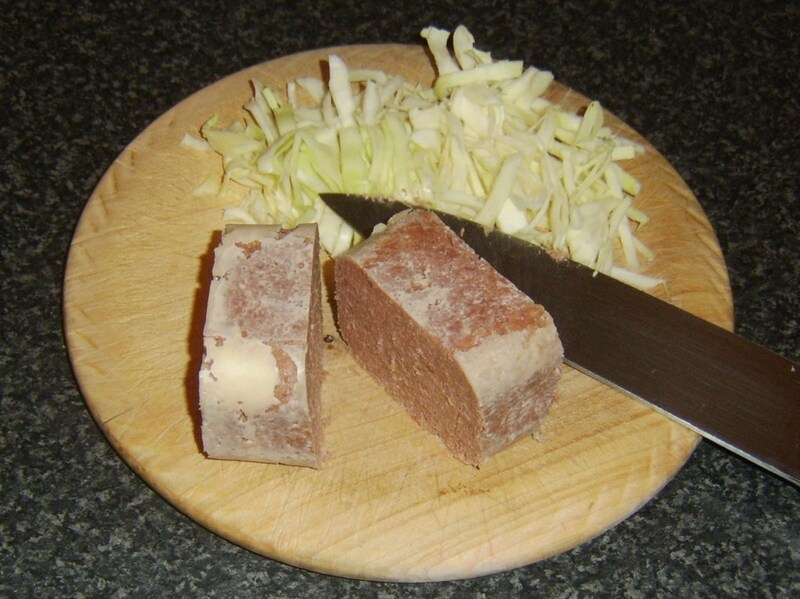 I am SO making corned beef and cabbage this next week! I will use this as a guide!